Q.03.2019: Is it more effective between doing a certain muscle groups on certain days vs a “fully body” workout? Or, do these two techniques simply target different goals? For a general fitness client there are benefits to both of these things. A split routine will generally allow you to focus more on the development of specific muscle groups or body parts and move heavier weight. Total body routines will allow you to hit more muscle groups multiple times per week and will generally burn a few more calories than you would doing a split routine. All that being said your reps, sets, rest period and nutrition are probably more of a predictor of you results than how you split things up. At Paramount we use a ton of different programming schemes for different clients. I often do a hybrid program where I focus on a specific lift as opposed to a muscle group and then finish up with less intense total body work. Earlier in my career, I was much more of a fitness snob. I would get caught up in this way being right and that way being wrong. At this point in my career my feeling is there are a bunch of ways to do it or general fitness. Try both see which you enjoy more and which gives you the results you like better. The most important things it to get of your couch get moving and be safe about it. When in doubt. Just lift heavy things. Q.04.2019: What is your favorite exercise? Q.01.2019: How do you avoid getting hangovers? With Saint Patrick’s Day just this past weekend, we won’t be able to help with your weekend hangover, but you can be prepared for next year. Well, the obvious answer is obviously don't drink too much. That being said here in Logan Square there is a cocktail bar on every corner. We know at some point you may be "overserved." Here are our strategies to help you avoid hangovers and be able to workout with us on weekend mornings! Stick to one main drink with minimal ingredients and avoid mixed drinks that are full of sugar. Drink water! One glass of water for one drink if you can and one before bed. Avoid shots. Stick to the rule above, one drink selection and one shot selection. Ex. Vodka soda’s and tequila shots. Don’t skip a meal to make up for all the calories from the alcohol. Alex and I are big fans of working out the day before a night of drinking and eating a good meal or two at home before going out. That helps set you up for success. For the next day, we add in a combo of the following (not necessarily everything): 7-8 hours of sleep, mineral water, emergen-c, kombucha, apple cider vinegar, activated charcoal, a good breakfast and workout to sweat a bit. Not necessarily all of those things, but a combo of them typically help us stay hangover-free. Here are some additional tips if you want to read more. Q.02.2019: Why would you consider removing a belly button piercing? We will get to our expert answer, but first we need to share a backstory. Back in 2010 or 2011, Alex and I made a bet about whether he could dunk a basketball. I truly believed that there was no way he could. He hadn’t been playing basketball for awhile and it seemed like an impossible feat. Loser of the bet had to get a belly button ring. And, I thought Alex would have looked great in a pink sparkly belly button ring. I even gave him a few weeks to practice. Alex can dunk quite easily and was a good sport when I got my belly button pierced with a pink sparkly ring. I wore this for about two years before removing it at the request of my chiropractor. I was experiencing back pain, and had been since I was in high school and he thought my belly button ring was making it harder for my body to get better. That’s what I remember anyways. “My teacher in school was not a fan of body piercings and tattoos. She believed that you were disturbing the correct flow of qi through the body. When it came to belly button piercings she felt that it blocked the reproductive system and was very harmful to women. The piercing is on the channel that is directly connected to our reproductive system. This could block the qi for healthy menstruation, conception or hormonal functions. To request a consult with Leigh at Essential Acupuncture Chicago, you can fill out a request form here. On November 10th we hosted our first Feats of Strength Event. This was a low-stress event to find your Paramount Max number and we had almost 30 people participate while raising over $350 for Hope for the Day. Hope for the Day is working to reduce the rates of suicide by increasing resources for peer-to-peer proactive prevention and providing mental health education. To learn more or to donate, Click Here. 2 Rep Max - Bench Press: Everyone warmed up and then kept adding weight to the barbell until they couldn’t complete two repetitions at that weight with excellent form. 2 Rep Max - Deadlift: Everyone warmed up and then kept adding weight to the barbell, trap bar or kettlebells until they couldn’t complete two repetitions at that weight with excellent form. Max Distance on the Rower in 4 Minutes: Once recovering for a bit after bench press & deadlift, members got on the Concept 2 Rower and tried to row as far as possible in 4 minutes. Max Hang: After destroying their grip from the deadlift and row, members got on the pull-up bar and completed a straight arm hang for as long as possible. Both personal training clients and group class clients attended the event and got to complete this workout with people they haven’t trained with before. Everyone has been working on their lifts minimally over the past few months, if not longer. This was a great way to see how far our members have come since they started working out with us in a safe and supportive environment. And, despite the challenging exercises and overall exhaustion, there was a ton of encouragement for their teammates and even more laughter. We are looking forward to our next event early next spring! That’s right. 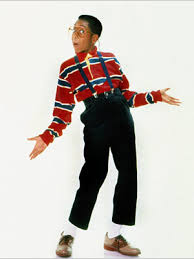 THAT Urkel. As in Steve. If you grew up in the 90s, you know all too well of whom I speak. If not, no big deal. For you young bucks, I say, stop trying to be Beyonce. Stop it, just stop it. You don’t have what it takes. You don’t have the voice, the penchant for creative child names, or that shiny robotic glove. And yet you strive to be like the Queen Bey? C’mon guys. Sorry to crush your dreams, but we here at Paramount would actually prefer you be more like Steve Urkel than Beyonce. So, what is this seemingly nonsensical rambling about? Great question. It’s about your pelvic position. One of the first things we teach our clients is to attain a neutral waist or pelvic position. Here, we use these two titans to mark the two extremes of pelvic positions. On the left, we have the tucked pelvis modeled by none other than Steve Urkel*. On the right, we have the anterior pelvic tilt as modeled by the one and only Mrs. Z. Where you need to be is somewhere in the middle. Come to think of it, we’re really encouraging you to be more like Stefan Urquelle**. All of us should have the ability to go from one extreme to the other, but it’s best if we spend most of our time at neutral. That means that middle point where the hips are properly aligned. **Flossin’, poppin’, lockin’, twerkin’, the Dougie, reverse double pump 360 slam dunks, and select sexual positions are, of course, exceptions to this rule. Karl Haraldsson is a man about town. But if you haven’t caught him biking around the city, you can catch him at Paramount. Just be sure to get up early. Of course, if you intend to sleep in, you can get to know Karl a little better here. He’s an interesting guy with a wide range of interests. Oh, and he might possibly be part Viking. I grew up in Lubbock, Texas. What do you do for a living? And what does that mean you do on a typical day? bunch of client meetings or doing data science. Y’know, fun stuff. When do you typically work out? I prefer to work out in the mornings. What are some of your favorite things to do (beside working out obviously)? I enjoy reading, mostly sci-fi and fantasy novels. I also like to smoke meats, Texas-style obviously. I enjoy eating at awesome restaurants and drinking boozy whiskey cocktails. In addition, I’m a fan of Divvying to get around town. I’m a supporter of the Cubs and FC Barcelona. What’s something about you that people at the gym might not know? My father is from Iceland. Why did you first start coming to Paramount? I felt like I was becoming too sedentary, and regular gyms weren’t cutting it for me. I used to go to gyms on my own or with friends off and on for years, but I could rarely sustain a rhythm. What can you do now in workouts that you couldn’t do before? final 100 to 200 meters. Rowing on the erg, hands down. How do you feel about working out with your significant other? Deserted Island Q&A—list a few things you’d want if you were stuck on one. What movies / TV shows would you bring? o I guess Franzen’s stuff—never read any of his books, but they’re waiting on the shelf. As much easily preserved food as I can carry. When we say "you," we really mean every individual who wants to swing some kettlebells, not exclusively you. Obviously. Paramount should be a home away from home for anyone who steps foot in the door. We don't care about your fitness level, ethnicity, sexual orientation, religion, or political affiliation. Here, we welcome diversity in all walks of life, from the clothes you wear to your ideological values. It really shouldn’t matter if you want to work out in your middle school PE shorts or a designer workout top. And frankly, it shouldn’t matter who you voted for. As long as your heart isn’t full of hate and you’re respectful of one another, you’ll help us create an even better place to exercise. Simply come as you are and have a good attitude. I know I shouldn’t have to state this at any time in our history, but I just wanted to make it crystal clear. Intolerance will not be tolerated. Hate has no home here. If you feel otherwise, we respect your right to exercise elsewhere.